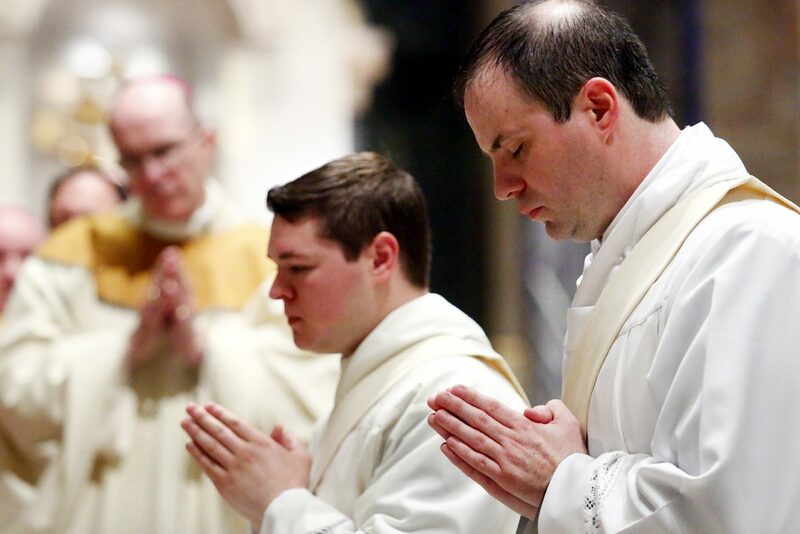 On Saturday morning, May 20, in one of the most solemn but nevertheless joyous rituals of the Catholic Church, Deacons Matthew Brody and Brian Connolly were ordained priests by Archbishop Charles Chaput in the Cathedral Basilica of SS. Peter and Paul. Joining Archbishop Chaput at the Mass were Bishop Timothy Senior, the rector of St. Charles Borromeo Seminary, and the other active auxiliary bishops of Philadelphia including Bishop John McIntyre, Bishop Michael Fitzgerald and Bishop Edward Deliman. Also, Bishop-elect Ned Shlesinger for the Diocese of Raleigh, who is a former St. Charles professor. Rounding out the clergy in the sanctuary was the usual large representation of the priests of the archdiocese. The most distinguished guests in the front pews were Jack and Connie Connolly and James and Karen Brody, the parents of Philadelphia’s two newest priests, along with grandparents, brothers and sisters, uncles, aunts, cousins and others who encountered and encouraged them along the way. Present too was virtually the entire student body of St. Charles Seminary, perhaps anticipating the day in God’s good time that they themselves would be in the sanctuary for the rite of ordination. God took pity on him, and directed him to choose 70 men from among the elders who could be true leaders and share the burden, really precursors for today’s deacons and priests of the church. “We see one another as brothers sharing the burden,” Archbishop Chaput said. The second reading was from St. Paul to the Romans, which speaks of the one body of the church. There are many parts but all the parts do not have the same function. Again, the archbishop reminded the congregation we all have a role if not the same one. Prior to the actual administration of the sacrament there was the always impressive litany of supplication in which the candidates lay prostrate on the sanctuary floor while the choir implored the intercession of the saints on behalf of those to be ordained. This was followed by the laying of hands on the candidates and the prayer of ordination by the archbishop, the two essential parts of the sacrament. Afterwards the priests in the sanctuary, in a sign of unity, also laid their hands in prayer on their two newest brothers. Fathers Brody and Connolly then joined Archbishop Chaput at the altar for the celebration of the Liturgy of the Eucharist. From a layman’s point of view the thunderous Litany of the Saints is perhaps the most impressive element, as the blessings and graces of the communion of saints are literally hurled on the prostrate candidates. Interestingly, afterwards both Father Brody and Father Connolly agreed for them the most impressive part was the laying of hands one by one by the multitude of their now-brothers in the priesthood. After the ceremony Archbishop Chaput did not keep his newest priests in suspense, he gave them their first parish assignments. 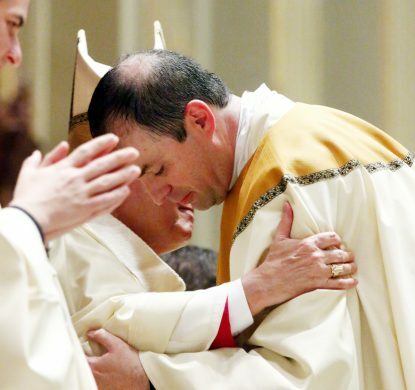 Father Matthew Brody will be a parochial vicar at SS. Peter and Paul Parish in West Chester and Father Brian Connolly will be a parochial vicar at Visitation B.V.M. Parish, Norristown. While this was the smallest ordination class since 1835, there are signs of change. Seated on the opposite side of the cathedral from the seminarians in cassocks and surplices was another knot of young men in suits and ties who may represent the future of St. Charles Seminary. 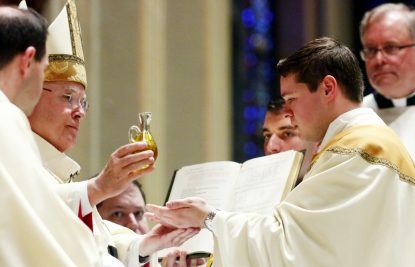 Ordination Day will remain an annual celebration at the Cathedral Basilica of SS. Peter and Paul for untold years to come. God bless Fathers Brian Connolly and Matthew Brody.